Everyone loves a good festival. The problem is that most of them are the same. Food vendors that serve fair food, bands that are too loud, too many people who have had too much beer, trash all over the ground. So, while we all love a good festival, we rarely have the opportunity to attend a good one. Well, not anymore. My best friend attends Incarnation Lutheran on Devine Street. Since 2011, Incarnation has held Oktoberfest in their backyard. You might be asking yourself…”how fun can a festival at a church be?” Well, the answer is, “more fun than any other festival in Columbia.” This event isn’t just fun, it’s impressive. Here’s a snap shot: a biergarten featuring German beers, craft beers and wine; German meals like Jaegar schnitzel, wiener schnitzel, bratwursts, potato salad, red cabbage, spaetzle, the whole nine yards; German music and dancing; and a playground, face painting, arts/crafts, and kids games. The music is going constantly, the kids are running around having a ball, the food is magnificent, and the atmosphere is just happy. I absolutely love this festival. My family and I look forward to it all year long. It just blows my mind how incredibly organized the festival is, too. The church members totally run the show. They cook, they serve, the youth group takes the orders, they run the games, they do it all. 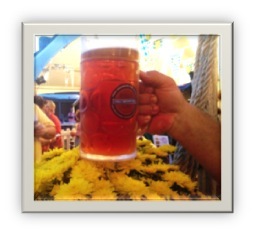 Oktoberfest was held this past weekend, so if you missed it, I’m sorry for ya! Trust me and put this on your calendar for next year. It’s a wonderful event, totally family friendly, and it gets better every year. 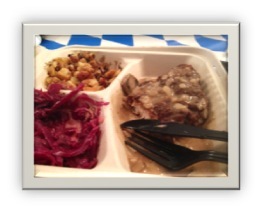 To the people of Incarnation, all I can say is “Holy Schnitzel” indeed! This entry was posted in Columbia, Elizabeth Webber Akre, Famously Hot and tagged Columbia, Elizabeth Webber Akre, every woman blog, Famously Hot, Gastronomy (by a Wanna-be Chef), Midlands, Oktoberfest by lexingtonmedicalcenter. Bookmark the permalink.